Discussion in 'Modified Explorations!!' started by ExplorerSportNu, December 5, 2004. Does anyone know if any 1998 explorer came from factory with white face gauges??? 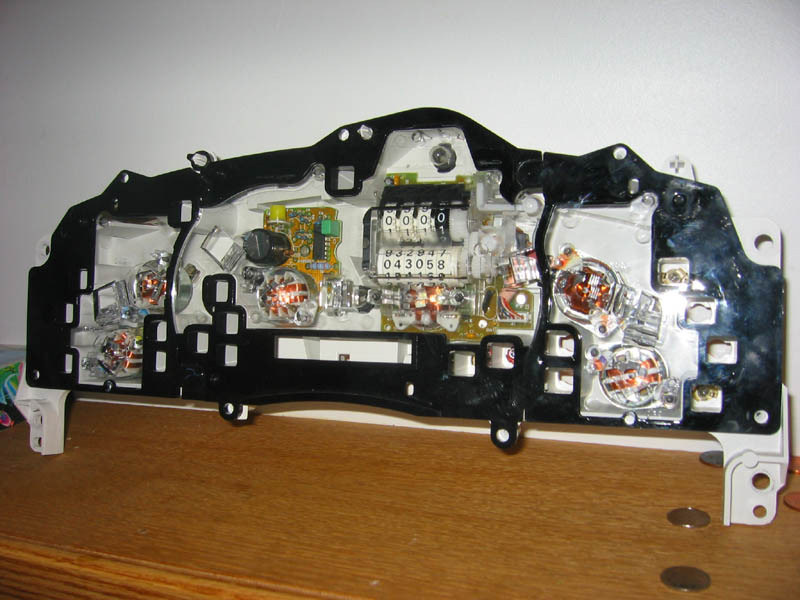 This isn't a stock guage from one of those units (you can tell because the numbers are white on black, not black on white), but this eBay unit might go cheaper than buying white guage overlays, and you'll get the red needles to boot. Very similar to my setup. Hey celly do you know what color this shines at night, does it shine blue, white, etc? with red needles? And does anyone know how you go about changing the mileage to match??? With stock bulbs, it shines sort of green. I've heard that with hyperwhite 194 bulbs, it will shine sort of blue. Remember, the colour itself is built into the overlays (sort of a green backing on the numbers). 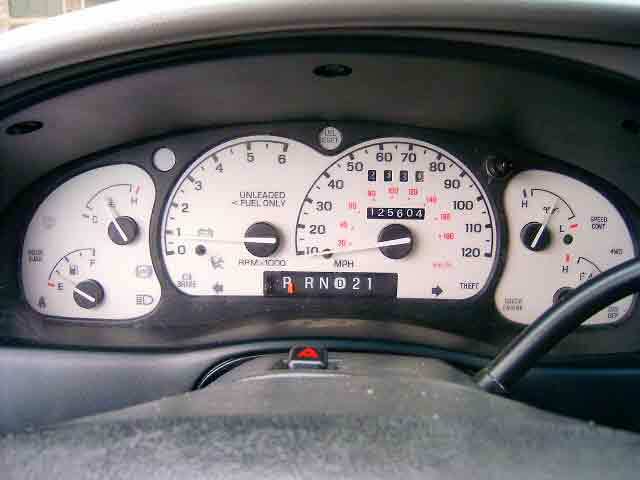 The only way you could get black on white numbers on the speedo/odo is to have a cluster from a '01+ Sport/Sport Trac. I actually have one for my Ex (in kilometers). Just waiting until my actual mileage catches up with the mileage on the cluster before I'll swap out. I actually have an EXTRA cluster with black on white numbers. No overlays (I already used them), no needles (same), no transmission gear indicator indicator (it's on my Ex too). 43058 miles off a 2WD Sport. I'd let it go cheap since I'll never use it except to maybe cannibalize some bulbs out of some day. I already included a pic in my last post (just took it). Look up. p.s. I don't know what's involved with getting the mileage to match. I've heard you can get dealers to do it. FYI, the only difference between the 2WD and 4WD is the indicator on the overlays that shows the switch between the two. I think the 2WD cluster could be made to work with a 4WD. I know this cluster doesn't have a bulb for the 4WD indicator but one could easily be added. Not sure what else is involved. I've also never tested this unit. I assume it works.